Open season in Lake Georgina runs from the first Saturday in November to the 30th of April. Unlike nearby Lake Selfe there is no winter fishing season extension for this small lake. Some years it freezes over in winter so I guess that trout would likely be a little sluggish at that time of year. Come to think of it the trout in this lake are subjected to temperature extremes at both ends of the scale with the water heating up to 20 degrees C in high summer. View over Lake Georgina looking north. You are also permitted to fish on Lake Georgina from a small boat that isn’t being mechanically propelled. 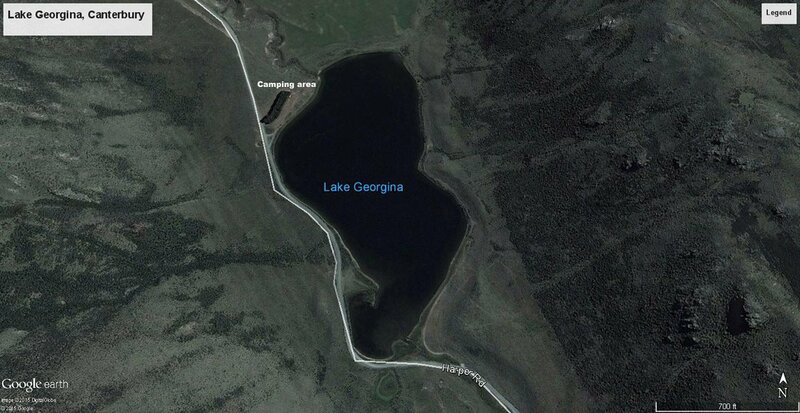 In other words you could row a dinghy around on this lake either harling or drifting and casting. I don’t recall ever seeing a boat on Lake Georgina. The limit is two trout per angler. The lake is quite small at just 16 hectares and only several meters deep at most. To say that it is exposed to the full force of the nor’wester or south-wester is an understatement. 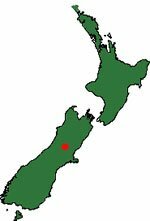 I once parked here beside the road for a bit of a fish on the way back to Christchurch from Lake Coleridge further up the road. The force of the wind was so great that it ripped the car door handle from my hand and caused a bit of damage beside the hinges. It was an old car so I wasn’t that worried. However lesson learned. I should have parked facing into the wind. Lake Georgina from under the trees looking south. Lake Georgina on Opening Day. There is a row of pines trees at the northern end of the lake that does provide some shelter for camping – but not a lot. Quite a few anglers camp and fish at this lake on Opening Weekend every year. Lake Georgina has good fishing and easy walking access all the way around the shoreline. Both spin fishing and fly fishing are permitted. There are only rainbow trout in this lake; the heaviest reaching around 2 kg in weight. The water is usually very clear and trout will often follow your spinner all the way to the rod tip without taking! Fly fishing is generally more productive than spinning. If you are going to try spin fishing a smaller lure like a Mepps, or 7g gold, brown or green Tasmanian Devil should do the trick especially at change of light. It clear bright conditions fly fishing will be way more effective – especially when the water is very clear. You can see in the photographs Lake Georgina is in quite an exposed position with little more than barren looking mountain sides and tussock for scenery. It does though have a charm that grows on you over time. Open Season: 1st Saturday in November until the 30th April. Both fly and spin fishing permitted. The limit is 2 trout. There is no winter season fishing on Lake Georgina. The lake is stocked with rainbow trout by Fish & Game. 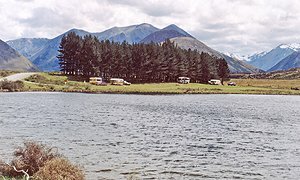 Lake Georgina, Canterbury high country. Map courtesy of GoogleEarth and DigitalGlobe. Click on map to enlarge. Here is another great video from Kevin O’Hanlon about trout fly fishing with the aid of a float tube in Lake Georgina. The trout are feasting during summer, on massive hatches of Green beetle, bringing the resident Brown and Rainbow trout to the surface making for exciting fishing! All tackle in this video supplied by the Fisherman’s Loft, Christchurch. Below: Kevin O’Hanlon fly fishing with the aid of a float tube on Lake Selfe. Some good tips to get you into the action on this small Canterbury high country lake.